Plant based cannabinoids for plant powered goodness. Noble Hemp is a socially responsible health and wellness company that aims to help heal through the power of our Premium Handcrafted Hemp CBD Products. All Noble Hemp CBD products are handcrafted using 100% organic hemp. We only produce in controlled small batches allowing us to create a premium product that is tailored to our customer’s needs and expectations. All our products are 3rd Party Lab tested to ensure they are free of all toxins and pesticides resulting in one of the purest hemp oil’s available. The Hemp Farming Act of 2018 was a proposed law to remove hemp (defined as hemp with less than 0.3% THC) from Schedule I. It became the 2018 United States Farm Bill on December 20, 2018. We remove all THC from our products to be 100% compliant. 100% PEACE OF MIND MONEY-BACK GUARANTEE! Noble Hemp is committed to providing total customer satisfaction. We’re 100% confident that you’re going to love Noble Hemp Daily and experience amazing results. Therefore, if you’re not completely satisfied within 30 days of purchase, we’ll cheerfully refund your full purchase price, no questions asked! Order right now with confidence! Satisfaction Guaranteed… Order from Noble Hemp with Confidence Today! Awesome! My wife sleeps better after using this product. Highly recommend. Started using this product for hip discomfort that affected my walking..easy to use..dropperful twice daily…has helped reduce my pain..and as a side effect ..a better sleep! Recommend! 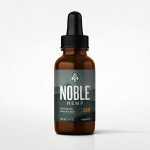 Noble Hemp Premium Hemp CBD Extracts are for conscious consumers who are serious about improving their health naturally. Like you, they no longer wish to compromise their health through the inadequate and often dangerous solutions offered by traditional medicine.They’re excited to invest in their bodies the same way they invest in the rest of their life. Slip into your purse or pocket easy access on the go! All Noble Hemp products are grown in beautiful Colorado in licensed and trusted greenhouses and local farms. After harvesting, the dry materials are taken to our state-of-the-art facility, where we use Super Critical C02 Extraction. This superior process ensures the hemp’s essential nutrients are preserved for the most potent and cleanest extracts. But our exceptional quality control doesn’t stop there. Each batch of extracts is sent to our 3rd party lab to be rigorously tested to ensure they’re 100% free from pesticides, herbicides, fungi, mold, heavy metals, and mycotoxins. Our premium hemp oil extract is combined with organic coconut MCT oil because it is a vital source of energy and one of the cleanest fuel sources for the body. The end result? Noble Hemp Daily, the purest and most effective hemp extracts on the market. You can place your order by selecting one of our Handcrafted Premium CBD Extracts. After that, we then process your order and quickly get it ready for a USPS truck! Your order is then delivered by USPS securely packaged & ready to begin your journey! Order Noble Hemp Daily today and discover its remarkable benefits for yourself!